Harness the power of Journaling! I’m having so much fun lately in my art journals. What do I use them for? I use them to record my travels, document my methods, take workshop notes, writing and illustrating my morning pages, and for just playing around in the paint! I have journals lying around everywhere in the studio. I refer to them frequently, sharing them with friends and students all the time. There are countless compelling reasons to fill their pages, and the benefits of this habit have been showing up in my art life. As always, when something really works, I love to share it with you! Today, I’m excited to tell you about My 5 Biggest Reasons why YOU should harness the power of art journaling! 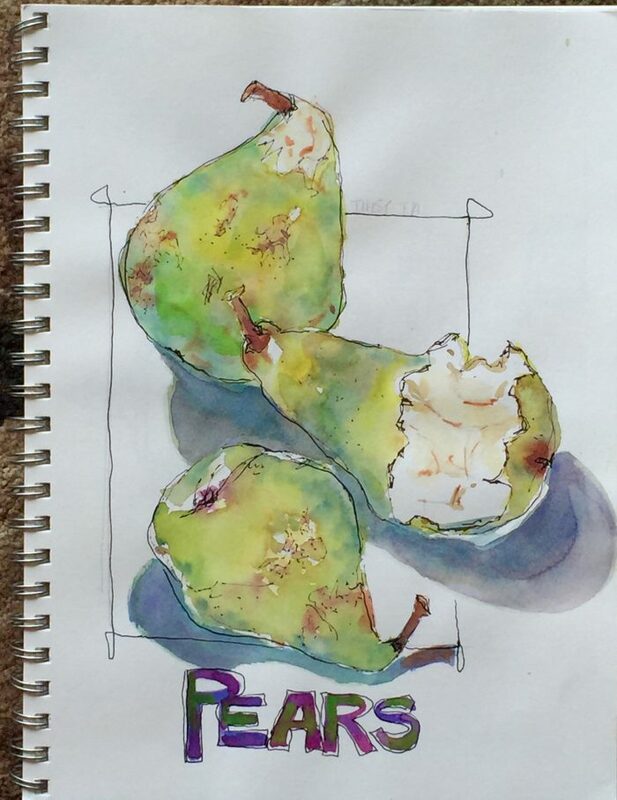 A quick study of a pear as I slowly demolish it…bite by bite. Using this snack as my chance to experiment with colorful shadows and creative lettering. Reason #1. A Journal is the perfect place to PRACTICE! WHY PRACTICE? Ask yourself,” Would an actor go onstage without rehearsal? Would a soprano sing without a warm up? Would a pianist play without practice?” As painters, why do we think we can paint without similar efforts at staying sharp? If you don’t practice, your painting sessions probably go something like this: With great hope you say, “I’m going to paint today!” You feel so good as you begin. You get everything set up and GO! But, then, that sinking feeling sets in when you realize things are not going that well. You, also, realize it’s been a few days (or months) since the last time you painted. If you have grit, you plod along…often to a mediocre result. Then, you exclaim, “Oh I wish I could paint better…”, and put your materials away until the next time you decide to try again. This scenario would be so much better if you just practiced in between!! Don’t worry, you’re not alone Most of us do not paint enough, nor do we practice enough. It’s a fact! However, to go from ordinary to exceptional, you need to practice. 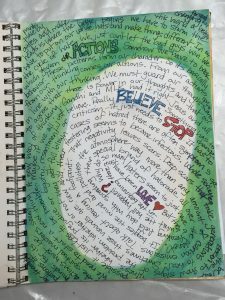 Practicing through regular journaling can keep you inspired, stop you from getting rusty, speed up your technique and help give you the competence and ease you need to complete the big stuff. Reason #2. A Journal is the perfect place to Experiment! The painting above was my opportunity to experiment with some iridescent and interference watercolors I ordered. Try stuff you haven’t done before in your journal!! Have fun! Experiment! It you are at a loss for ideas…Try one of these! Gesso a piece of paper in your journal and then use your watercolors. 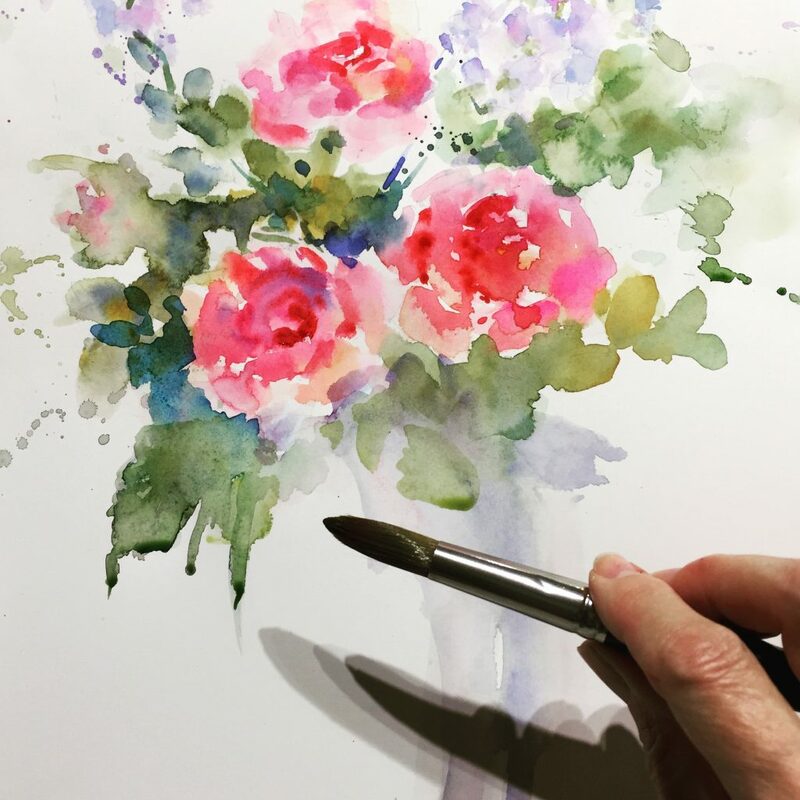 This is one of my favorite ways to paint with watercolor! Incorporate collage with your work. Use stamps and different inks with stencils- apply paint or lift out existing color… Both can be so fun to do! Reason #3. A Journal is the perfect place to Play! How do children learn? They PLAY! How is it that we’ve forgotten that play is fundamental to learning?! Ask yourself, “What If…?” That’s when the magic happens! Take a page of your journal and make it your goal to explore on that page. How does that new color mix with your establish colors on your palette? Is it transparent, or granulating? Use your journal to find out! What about that brush you purchased…? Take a page out of your journal and make some marks, then make some notes. Playing in your journal will help you grow and be a safe place to challenge yourself . A timed study with a big fat brush I’ve been wanting to use…Loved the result and I plan to do more! Picasso knew what he was talking about! Not only a creative genius, he was also an extremely hard working and prolific artist. Picasso produced an incredible amount of art over an extremely long and productive life. Hmmm, what came first for Picasso? The creativity or the work? Perhaps the quantity of work he produced is directly related to the quality of his inspiration. Did you ever think of it this way? Maybe the more we do, the more we’ll be inspired to do! Looking for inspiration? Don’t wait for it to happen…try working and being ready for inspiration to find you! Bringing small projects across the finish line is one great way to get working. A journal page is an opportunity to do something small. Something quick. Something fun. Something personal. Something to help us keep our skills sharp. If you’re stuck for ideas, journaling may provide the next breakthrough you’re waiting for! REASON #5. Silence Your Inner Critic: Your journal is safe. If you are shy or simply want to reserve your art as something you do only for you… then journaling is for you. The only critic you’ll have to deal with will be your own inner critic. All of us have Inner Critics to deal with. Some of us have an entire committee! My friend and excellent teacher, Kathie George, refers to this king of inner critic as the “itty-bitty sh!++y committee (IBSC)”. 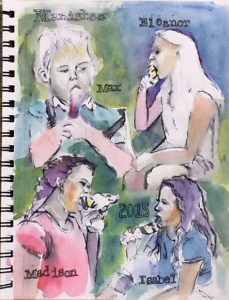 If your IBSC meets every time you paint, then keeping a journal might be a great way to learn to muzzle those negative voices in your head. There’s nothing more paralyzing than feeling as if everything you have to do needs to be perfect! Getting over this demand for perfection can be a challenge for those of us who are perfectionists. Trying something we know nothing about can be a real ego challenge! Taking the small step toward your artistic goals by journaling rather than “painting” will feel more like a baby step than a giant leap. Surprisingly, some of these small pieces may become your favorite gems! Words can be a great way to get started. Maybe you already do morning pages, or keep a diary. Let your words inspire some illustration or artwork…let that be what gets you going! 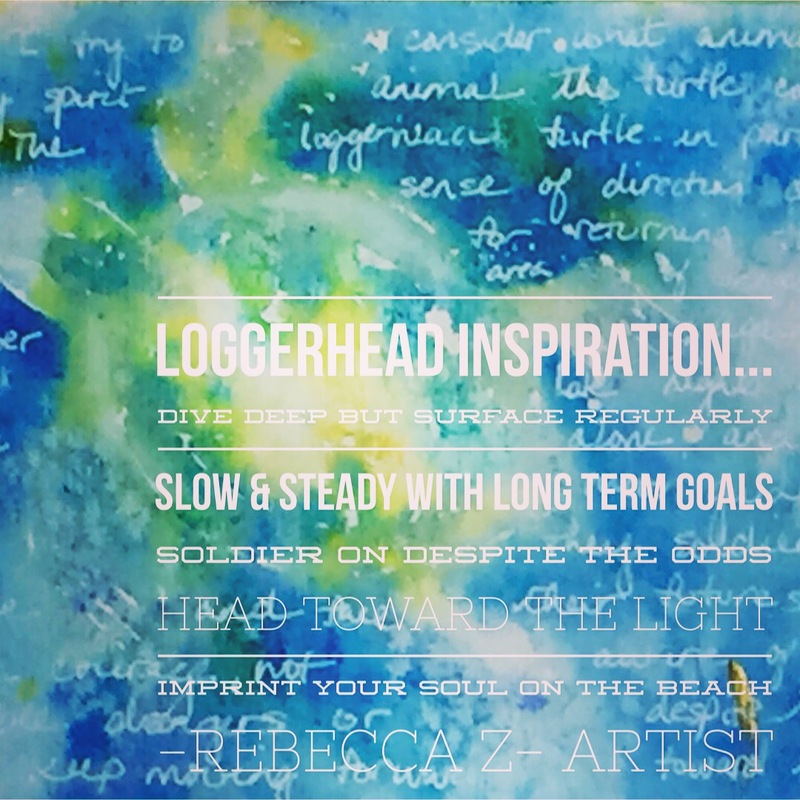 Whether you’re playing around or being introspective, keeping an art journal is something I’d encourage you to do! 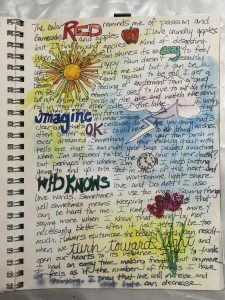 Let these 5 Reasons light a fire under your art journaling, and make it a regular part of your studio practice. Whether you’re a hobbyist or a professional, there will be benefits to your creativity! I promise! After all, that’s what I love to share with those of you who are taking this artistic journey with me. Speaking of journeys, I’ll be taking my art journals with me as I head out on my next Art Adventure to Italy in September. I hope you’ll join me by subscribing to my newsletter if you’ve not already done so. I’ll also be posting on Instagram @rebeccazartist and on Facebook #Rebecca Z-Artist. Don’t Forget to Sign up for Rebecca’s Upcoming NewZletter! Click here to sign up for Rebecca’s NewZletter! Thanks for the inspiration. Is one born with talent, or can one develop talent? I really would love to improve! I like your journal idea. 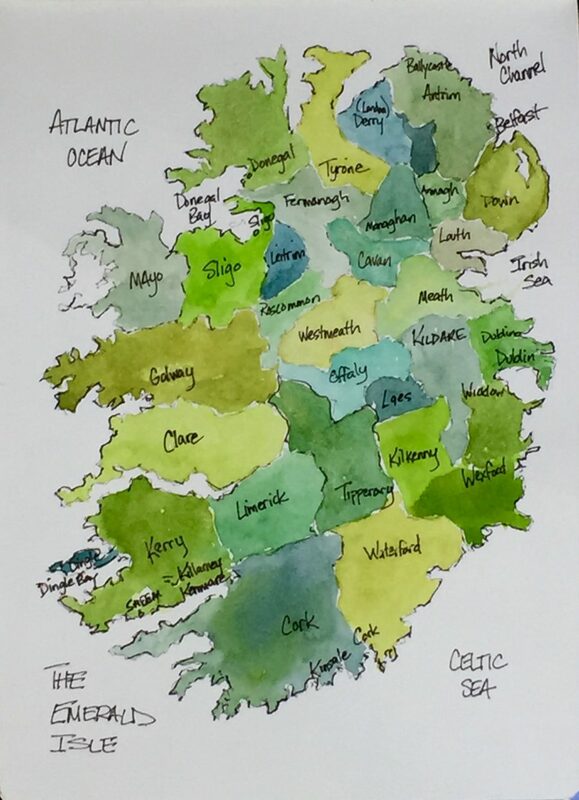 I just went to France and Germany with my two sons to the village where I was born, and my oldest son, Marc, wants me to illustrate this trip with my remarks! It seems when I’m home other less interesting things get priority rather than trying to be creative like when I was in Myrtle Beach where this was my top priority. I am looking into classes at the local college, but it takes a kick in the pants. You really are inspiring me, thank you so much.